It’s back to school time (more or less) and kids all over America are begging for a new soft-sided lunch box with a decal of Justin Beeber or some such on it. Meanwhile, middle-aged men are scouring eBay to see if they can over-pay for a vintage The Empire Strikes Back lunchbox from the waning days of the metal variety. To help me in this endeavor, I have taken to preparing my lunches in advance. This way I can be more planful in what I eat and ensure I have nice variety of food and controlled portions. It occurred to be that the perfect tool to help me with this was the traditional Japanese bento box, which I have been served many times in Japanese restaurants. I always loved the little compartments and how everything is neat and perfect. So I set out to find the perfect bento box and I thin I may have – the Modern Bento Box from Portland, OR-based Canoe. With this Bento Box (or multiple ones if my experiment does well) I can prepare my lunch and make sure I don’t stray, er, outside of the box. 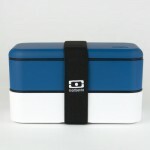 See the Modern Bento Box and all the really neat products curated by Canoe here. Lost Cowboy is powered by	WordPress 5.0.4 and delivered to you in 0.834 seconds using 45 queries.